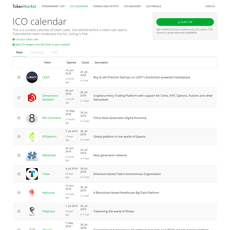 CoinMarketCal is the most popular cryptocurrency events calendar. 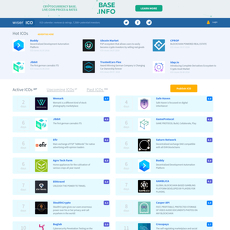 CoinMarketCal promotes themselves as evidence-based and community driven. 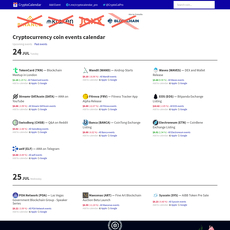 The calendar covers all important events such as software developments, forks, coins being added to exchanges, mainnet launches, airdrops, burns, events and conferences, ICO’s, and more. 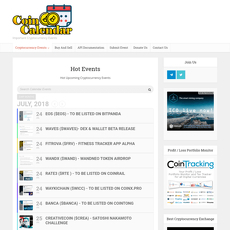 Events are added by the community and are also voted on by the community. Events which are legitimate will get higher amounts of votes from users demonstrating their legitimacy. 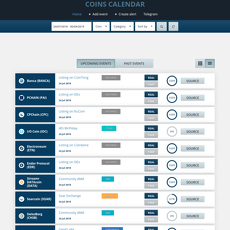 Users can filter information at the top of the homepage based on exchange, coins, keywords, and categories. Users can also add email alerts to be notified when an event goes into the “hot” category or a new event is added for specific coins. 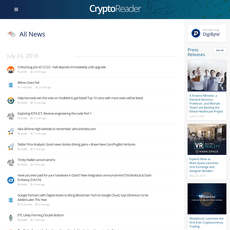 Users can also subscribe to a weekly newsletter which notes coins to monitor. The calendar has both a Twitter and a Telegram bot which automatically post new events as they are added. The calendar is free to use and makes its money from advertising. The calendar has a straightforward and easy to use interface. Users can click on events to get more information on them. The website gets high reviews from users.